The estimated number of deaths from terrorism worldwide rose from 3,329 in 2000 to 32,685 in 2014, according to a November 2015 analysis by the Institute for Economics and Peace. The vast majority of lives lost to terrorism in 2014 — 78 percent — took place in the five countries where most terrorism activity occurred: Iraq, Nigeria, Afghanistan, Pakistan, Syria. More than half of incidents claimed were attributed to Boko Haram and the Islamic State (ISIS or ISIL). However, 93 countries experienced at least one terrorist event in 2014, including France, Australia and Austria. Commentators have frequently speculated about the nature and characteristics of terrorism, including the role of technology and social media in perpetrating terrorist acts. Since the 9/11 attacks, there has been a great deal of discussion about the root causes of terrorist violence, but fewer rigorous empirical assessments have been attempted. In terms of the link between economic growth and terrorism, the existing evidence is inconclusive: Some authors claim there is a positive link; others suggest there is an inverse association; and some have found no statistically significant relationship. Some of the latest evidence in this debate comes from a 2015 study published in Oxford Economic Papers, “Economic Growth and Terrorism: Domestic, International and Suicide,” which is based on a cross-national, time-series data analysis of 127 countries for 1970-2007. The information for economic growth, as annual percentage growth in GDP per capita in 2005, was obtained from the World Bank’s World Development Indicator 2013. 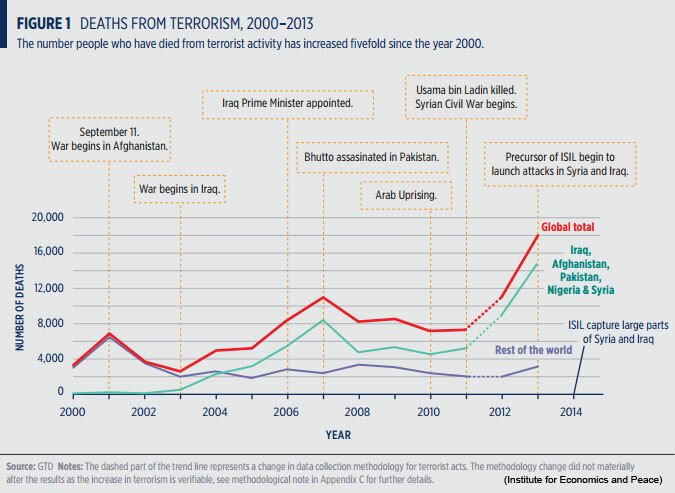 Data measuring terrorism violence is from the Global Terrorism Database (GTD). The author, Seung-Whan Choi of the University of Illinois, Chicago, also controls for a number of variables, such as income inequality, democracy, state failure, population and a variable designating Post-Cold War conditions. This study provides new and interesting insights for two reasons. First, the author introduces a distinction between agricultural and industrial economic growth, as opposed to a single economic output indicator. Choi notes that “only some forms of economic growth are associated with terrorist activity, and even then, they only correlate with particular forms of terrorist attacks.” Second, the study measures the impact of economic growth on three expressions of terrorism, as opposed to a single, homogeneous indicator of terrorist violence. Importantly, previous studies focus on one modality of terrorism, “under the implicit assumption that terrorist groups will use the same conventional attack tactics despite the continuously enhanced security environment.” The author distinguishes between international terrorism — involving at least two different nationals — domestic terrorism — wherein the victims and perpetrators are from the venue country — and suicide attacks, when a terrorist purposefully dies in the process of carrying out his or her mission. Although the assumption has been that fast and steady growth would provide more opportunities for potential terrorists and their would-be sympathizers to participate in the economy, and thereby reduce terrorist activity, the study’s data do not support that notion: “The findings are not all optimistic because a well-functioning market economy based on quick-paced but steady economic growth is not necessarily a cure-all solution for growing terrorist threats.” Further, the study’s analysis does not support the idea that social cleavages – specifically, an expanding gap between the rich and the poor and the resulting grievances of economic losers – necessarily increases terrorist activity. Citation: Choi, Seung-Whan. "Economic Growth and Terrorism: Domestic, International, and Suicide," Oxford Economic Papers, 2015, 157–181. doi: 10.1093/oep/gpu036.